I’m not sure where 2018 went, but I see my calendar reads “December”. The next 3.5 weeks are nothing short of whirlwind days and long cozy nights. Being a kindergarten teacher, this is really a fun time of year. However, it is also a stressful time with trying to intertwine the fun with the learning. But, December is a great time to be a teacher. 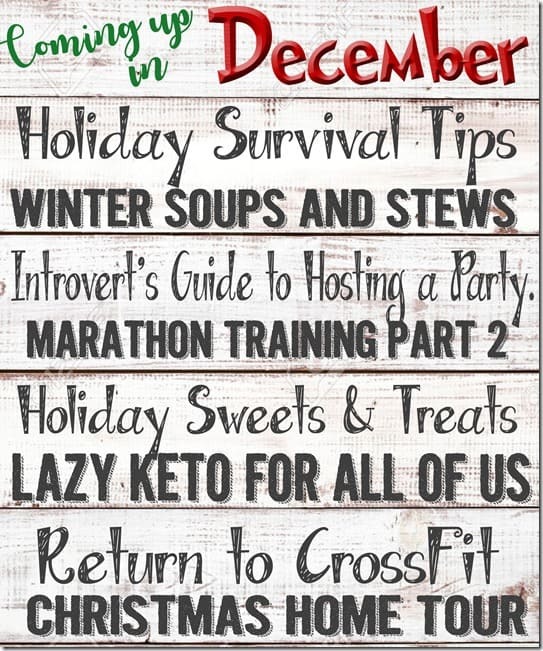 On the home front, I am hosting 2 events in December. One is my church group which is really our circle of friends and family. The other event is a holiday/open house for my school faculty. Several people have mentioned wanting to see the house after seeing the RV transition. Each month, we have a social event outside the school walls and we needed a host for December. I *think* I can fit most of them. We shall see! Return to CrossFit….it’s been a long time coming. I’m so ready to return. I’m not waiting until January. Winter soups! We all love them. We need them. I have them. Stay tuned. Lazy Keto. This time of year, lazy is a rare word for most of us. 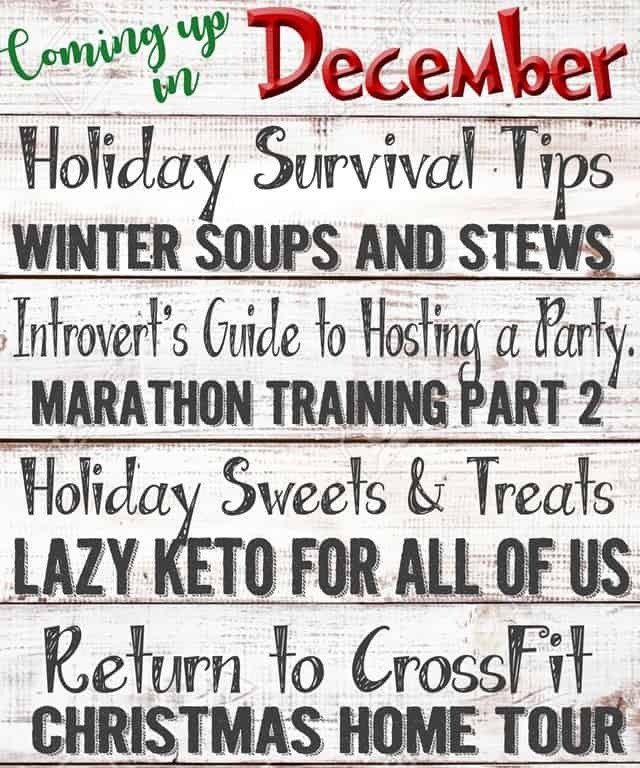 So what in the world is lazy keto and why do I need to know about it? Marathon training take 2. At this point, I’m not sure where I am with my knee injury so I’m not even sure if this can happen. Coming up that is not listed on that nifty graphic? The fastest desperation meal ideas. Treat yo’self for the holidays. Dogs are people, too and Santa needs a list. Why you need a hot chocolate bar in your house, no matter the available space. And many more random December-y things.